Idahoans will be the first to tell you that the state produces much more than potatoes. The recent extension of the federal production tax credit (PTC) for renewable energy generation could help make Idaho a hot bed for geothermal development. The state, which currently does not generate any electricity from commercial geothermal power plants, has the potential to yield 5 million megawatt hours of geothermal energy a year, according to the Energy Foundation's latest "Renewable Energy Atlas of the West." The state's potential for geothermal electric power development is comparable to California and Nevada, which together produce over 2,700 megawatts (MW) of electricity from geothermal plants, according to the Geothermal Energy Association (GEA). Some companies are already tapping into the opportunities that many experts agree are stewing below Idaho's soil. Yet others are hesitant to look too far forward, due to unknown certainties about the continued renewal of the PTC. Idaho Power Co., the state's largest utility, set a goal in its 2004 Integrated Resource Plan to develop 100 MW of geothermal power to help meet its future power needs. U.S. Geothermal Inc., a Boise-based alternative energy company, has already signed a 20-year power purchase agreement to provide Idaho Power with 10 MW monthly upon completion of its $40 million geothermal power plant in Raft River, Idaho. Institutional investors in the company include Goldman Sachs & Co. and Winslow Green Growth Funds. 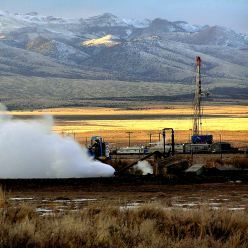 The site, a former U.S. Department of Energy (DOE) geothermal test facility, contains a proven geothermal reservoir capable of providing up to 110 MW, according to a study by research firm GeothermEx Inc. The plant is scheduled to be up and running by the summer of 2007, says Saf Dhillon, an investor relations consultant for the company. U.S. Geothermal plans to finish phase two of the plant, designed to generate an additional 26 MW, by 2009. The PTC mandated by the Energy Policy Act of 2005 is the driving force behind a recent surge in geothermal development throughout the country, says GEA's executive director Karl Gawell. The 1.9 cents per kilowatt-hour tax credit, which was recently extended until Dec. 31, 2008, applies to electricity generated by certain renewable energy resources, including geothermal, solar, wind, landfill gas and hydropower. Geothermal is considered a renewable energy source because it does not consume any fuel or produce significant emissions. But investors are still reluctant to fund projects that can't be completed by the PTC's expiration date, Gawell says. "Investors don't like to gamble on what future Congresses might or might not do," he says. Half of the country's geothermal energy production occurs on federal land, much of it in California and Nevada, according to the U.S. Department of the Interior. To encourage further geothermal energy development on federal lands, Interior Secretary Dirk Kempthorne last summer proposed rules that would require more competitive leasing for geothermal resources on nearly all federal lands designated for this type of development. The proposed rules would also share $4 million in current royalties with counties where geothermal production occurs. The U.S. Bureau of Land Management (BLM) expects to finalize the proposed rules by April, according to BLM spokesman Matt Spangler. Over 50 percent of Idaho's land is federally owned, according to the U.S. General Services Administration. But Gerald Fleischman, an engineer for Idaho's Department of Water Resources' Energy Division, says the proposed BLM policy does not encourage companies to invest in geothermal exploration on federal land. "No one can afford to invest the cost of exploration if the area will be put up for competitive leasing after that entity has proven something about the geothermal resource there," he says. "The BLM's policy on leasing land for wind energy development is very different. É In wind, it is all non-competitive, first-come, first-served leasing. And wind is a far easier resource to prove than is geothermal. If anything, there is even more reason for geothermal to be leased non-competitively than there is for wind." Idaho does not currently have a renewable portfolio standard (RPS) requiring utilities to supply a percentage of electricity from renewable energy. Both Washington and Montana have an RPS, and Oregon Gov. Ted Kulongoski (D) is developing one. While Idaho does have an energy plan, Fleischman says the current state legislature does not favor an RPS. An estimated 61 new geothermal energy projects are now under development throughout the country, which could produce over 2,000 MW of electricity annually, according to GEA. This would almost double installed geothermal power capacity to over 5,000 MW, producing 18 billion kilowatt-hours of electricity annually. Yet the geothermal industry recently took a hard hit when the federal Office of Management and Budget (OMB) in its FY 2007 budget cut funding for geothermal power research and development. The $23 million that DOE previously spent on geothermal research and development is slated for other renewable energy technologies such as biofuels. "OMB made a false assumption that this is a mature technology," Gawell says. "If we're a mature technology, what isn't? Analytical support for their conclusion doesn't exist." The House is recommending that $5 million be restored in the DOE's budget for geothermal research and development, while the Senate is recommending that all $23 million be restored. A final appropriations bill is expected to be approved in Congress by Feb. 1.